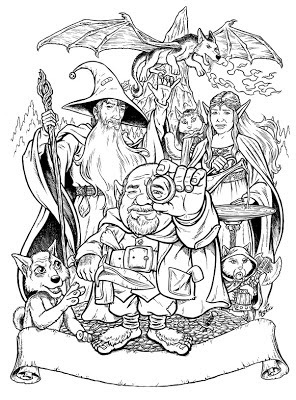 THE BRILLUSTRATOR: Hobbity Holidays to all, there and back again! Hobbity Holidays to all, there and back again! OK, it's finally here! My new Brill/Stockham Christmas card for 2012. This year's theme is, obviously, The Hobbit! I had initially thought about doing one based soley on the designs of the new movie, but since it was going to be caricature-ish and cartoony, I thought perhaps I should base it more on the old Rankin/Bass TV movie. 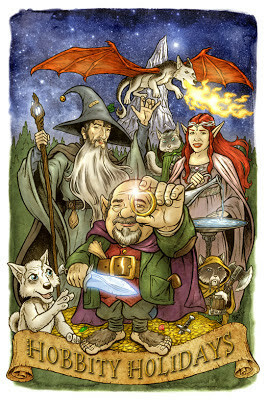 You know, the cartoon one with John Huston as Gandalf and Orson Bean as Bilbo. Thats why the cutesy cartoon version of me is wearing that particular outfit. But when working on the sketches of Bel and Edmund, I realized I preferred the new movie designs for their costumes. Although, in deference to the cartoony style, I gave Bel fantasy comics/games elf ears instead of purely LotR ones. Sorry Bel! Also I liked the movie gollum better for our dog (whose name is actually Gandalf) than the REALLY creepy TV one! I put our other Husky, Luna, in the background as Smaug. Our cats Merlin and Gallifrey are portraying Thorin and Elron respectively. In any case, it's a bit of an amalgamation of the two, which works for me because I LOVE the old Hobbit movie! And as much as I enjoyed the Peter Jackson movies, I still have a soft spot for the style and watercolor wash elegance of the Rankin/Bass version of middle Earth. Anyway, happiest of Holidays to everyone and hopefully an even happier new year! 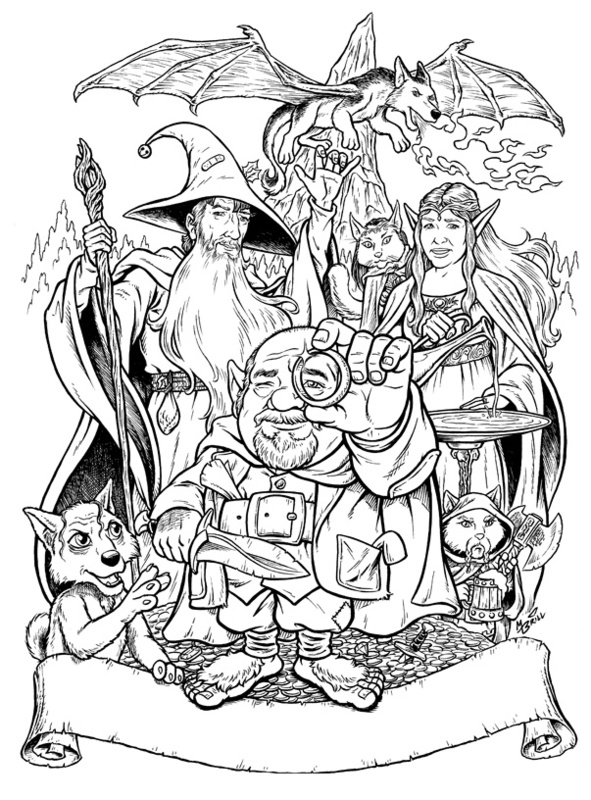 PS: Here is the black and white line art.